Terror victims' group slams president for mentioning Jewish baby's murder at memorial for Arabs shot in 1956. Terror victims' organization Almagor is angry at President Reuven Rivlin for invoking the murder of baby Chaya Zisel Braun – who was run over by an Arab terrorist Wednesday – at a memorial ceremony for the Kafr Kassem massacre of 1956. 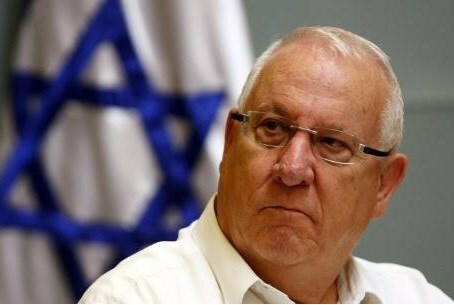 At the ceremony, Rivlin called for an end to "the cycle of bloodshed." "On Wednesday night, I was present at the funeral of a new born baby, just three months old, Haya Zisel, who was cruelly murdered by an Arab terrorist, a resident of East Jerusalem. This abhorrent murder of a child shakes and disgusts all those who have a heart. This murderous act of terror, marks another difficult moment in the painful history of the Israeli-Palestinian tragedy." Bereaved fathers Ron Kerman and Aryeh Bachrach, leading activists in Almagor, accused Rivlin of drawing an unjustified parallel between the events. "There is no comparison between a single act in Kafr Kassem, which occurred many years ago, and the ongoing terror from the Arab side. Nor is there equivalence between the Jewish side, which prosecutes and denounces the isolated acts of revenge, and the support of the Arab leadership for terrorists, whom they call freedom fighters," the fathers said. The presidential visit itself was a bad idea, said Kerman and Bachrach. "It would have been better if this visit never took place," they added. "No one will think better of Israel because of it. It will serve Palestinian propaganda the world over as a reminder of an isolated incident about 60 years ago, and meanwhile, the Palestinians celebrate the terror acts they have been perpetrating against us ever since Zionism began." President Reuven Rivlin spoke at an annual memorial ceremony for the victims of Kafr Kassem, which he called a "serious crime" and a "horrible deed."